The execMBA from the Trulaske College of Business is a hybrid MBA program that's as mobile and global as you are. In the execMBA, you’ll learn to take strategic risks and become a more effective leader. With a rigorous curriculum tailored for experienced executives, our 21-month hybrid model delivers the personal interaction of a full-time MBA, but requires just eight weekends on campus and one 10-day international experience. The rest of the program is delivered online and completed on your own time. With distinguished faculty and an expansive alumni network, we’ll show you a better MBA. Graduates earn the same Master of Business Administration degree earned by full-time MBA students. Top 20 Online MBA Programs in the U.S. Applicants to the Crosby MBA program at The University of Missouri-Columbia are required to submit the following materials: GMAT scores, essay/personal statement, official undergraduate transcript, a list of extracurricular activities, and an updated resume. Particularly close attention is paid to applicants' GMAT scores (620 minimum), undergraduat...Applicants to the Crosby MBA program at The University of Missouri-Columbia are required to submit the following materials: GMAT scores, essay/personal statement, official undergraduate transcript, a list of extracurricular activities, and an updated resume. Particularly close attention is paid to applicants' GMAT scores (620 minimum), undergraduate GPA (3.5 or higher preferred), and personal statement. International applicants are required to submit TOEFL scores, with a 550 minimum for written test, 213 for computerbased, and 79-80 for web-based. While substantive post-undergraduate work experience (three or more years) is strongly considered, it is not a requirement for admission. Prospective students with excellent educational backgrounds in technology, engineering, bio/life sciences, journalism, and social sciences are historically successful in the Crosby MBA Program. The school also offers substantive review modules in statistics, finance, and Microsoft Excel during orientation week before classes begin. Columbia is a “great college town,” with an abundance of restaurants, bars, music, culture, parks, and related activities. Even though Mizzou enjoys a large campus at the center of town, downtown Columbia is just a few steps away, and there’s always something to do. 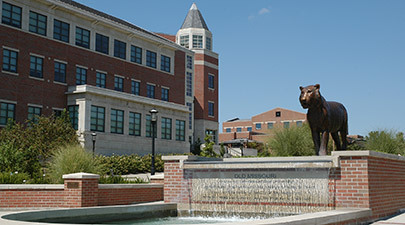 Students have described the Crosby MBA program as a “close-knit community of students who are very willing to help one another and a great learning community where there are a multitude of opportunities for students to get involved on campus.” This “open and friendly” atmosphere has helped foster a business program that students laud for being “cooperative” and “less competitive” than similarly sized MBA programs. The MBA Association at Mizzou holds “weekly happy hours and other social events,” where students have the chance to “play numerous intramural sports and even participate on club teams.” Prospective students may also be pleased to learn that the Association pays close attention to the diversity of its student body. Several Association members are also members of the National Association of Women MBAs, while others serve on the College of Business Diversity Committee. The Crosby MBA Program Career Services provides a broad range of services, including resume-building workshops, on-campus interviews, counseling, and a mentoring program. Companies are often invited to Mizzou to present themselves and recruit worthy candi­dates. While some students comment that networking opportunities with alumni and top employers are lacking, and “there doesn’t seem to be a push to attract companies outside the Midwest,” global companies, such as AT&T, Deloitte, and Edward Jones, Cerner, and Chevron have all made frequent visits to the school. One student tells us, “I just had coffee with one of our alums working for a major consulting firm in Philadelphia and that was just the start of my alumni search.” The MBA program also offers a variety of school-facilitated internship opportunities, and post-graduate job placement data suggests that Mizzou MBAs are not pigeonholed into one or two industries, but several, from manufacturing to non-profit and healthcare. The MBA Association has the Borderless Friendship Program that pairs international MBA students with domestic MBA students, as well as dedicated international career services resources. The MBA program has collaborated with MU's International Student's Career services office to offer programs specifically tailored to career placement for international students. Partial sponsorship to national conferences, of which Reaching Out MBA is considered. The College of Business has on staff a Director of Diversity and Inclusion, a current student serves on the College of Business Diversity Committee, and the College provides membership in The Black Business Student Association. The MBA Association members are also members of the National Association of Women MBA's. The website is www.mbawomen.org We also have the Association of Trulaske Businesswomen. Want more info about Trulaske execMBA, University of Missouri? Get free advice from education experts and Noodle community members. What career benefits can I expect from pursuing a Trulaske execMBA? What jobs do EMBA students have? What is the difference between an executive MBA and an MBA? What is a hybrid EMBA? What is the typical profile of a Trulaske execMBA student? What makes the Trulaske Executive MBA different from its competitors?